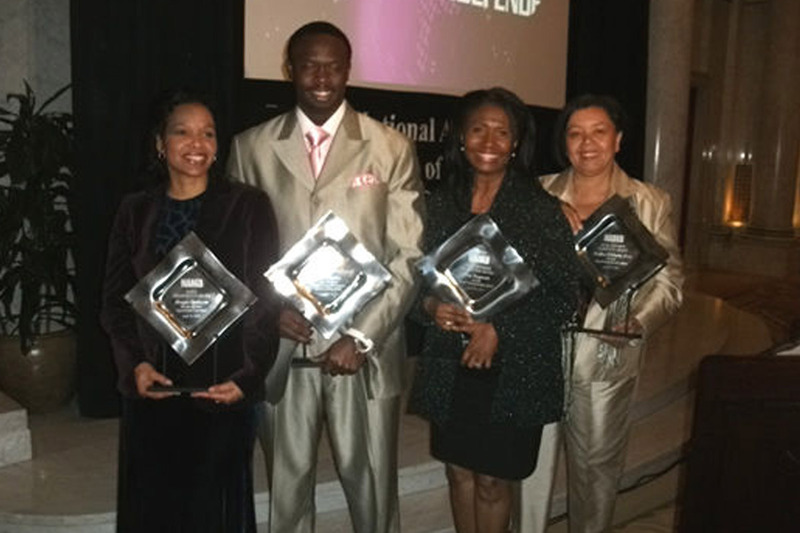 (BALTIMORE – April 23, 2010) – The National Alliance of Market Developers, and its sponsors (MillerCoors Brewing Company and the Chicago Defender), awarded these four people with awards last night at the Tremont during conference here in Baltimore. Pat Lottier, Publisher and CEO of Atlanta Tribune and dear friend of Baltimore Times publisher Joy Bramble received the H. Naylor Fitzhugh Humanitarian Awards. Evans Charles, CEO/President of Frontier Realty Development and Hospitality Group was named Entrepreneur of the Year; he has a string of hotels around the country. McGhee Williams-Osse, the Co-CEO of Burrell Communications Group along with Fay Ferguson, won the Moss Kendrix Marketer Award. And Maggie Anderson, the Founder and CEO of The Empowerment Experiment, was honored with the NAMD President’s Award. The conference, which kicked of Thursday night, lasts through Sunday.